Our conversation this week is with the scholar, Charles Slack. Slack is the author of Liberty's First Crisis: Adams, Jefferson, and the Misfits Who Saved Free Speech. His book chronicles the tumultuous early years of the United States when dissent was so feared that those who dared to criticize the government were put in prison or deported through the Alien and Sedition Acts. Our discussion focuses on three individuals: Matthew Lyon, the congressman from Vermont; Benjamin Franklin Bache, the grandson of the famous Dr. Franklin; and James Thomson Callender, the notorious Scottish journalist who helped break the Sally Hemings story in 1802. Once again, we find out how little some things have changed over the years. Sometimes the less-than-wholly-respectable journalists wind up doing a very important service to democracy. Charles Slack. Photo courtesy the author. Charles Slack is the award-winning author of several books. His latest book, Liberty’s First Crisis: Adams, Jefferson and the Misfits Who Saved Free Speech, was published in March 2015 by Grove Atlantic. Hetty: The Genius and Madness of America's First Female Tycoon, based on the life of Wall Street pioneer Hetty Green, won the 2005 Connecticut State Book Award for Biography and the Elle Magazine Reader Prize for Biography. Noble Obsession: Charles Goodyear, Thomas Hancock, and the Race to Unlock the Greatest Industrial Secret of the Nineteenth Century was based on the life of inventor Charles Goodyear. The New York Public Library named Noble Obsession one of the 25 best “Books to Remember” for 2002. Blue Fairways: Three Months, Sixty Courses, No Mulligans, an American journey based on a trip down the East Coast from Maine to Florida, one public golf course at a time, was a finalist for the United States Golf Association’s International Book Award. A graduate of Harvard, Slack was a newspaper reporter in Tennessee and Virginia before turning to writing and editing full-time. He works in New York City and lives in Connecticut with his family. You can learn more about Slack at his website. Charles Slack: [Jefferson's] first inaugural address is one of those founding-era documents that I don't think gets quite enough attention. He took the crucial step of famously saying, "We are all Republicans, we are all Federalists." What he meant by that was not, "We all have to get along." It was his way of acknowledging that this country has to absorb opposing opinions — that we have to have people who very strongly disagree with one another, and we have to learn to live with that. He even said that if someone goes so far as to say that they want to destroy the United States, if we let that person have their say, we are actually declaring ourself to be a stronger country because if we act in fear and throw somebody in jail for saying that, that's a symbol of our weakness, not of our strength. It's one of the most beautiful speeches I've ever read. You can read Jefferson's inaugural address of March 4th, 1801 from Yale Law School or find past Jefferson Hour episodes about Jefferson's inaugural. Clay: I know this sounds like an irresponsible question, but Callendar drowned in 1803 in the James River in three feet of water. Some part of me has always wondered, did he drown? Or was he drowned? It's probably irresponsible to think that way. But it happens. 'Who will rid me of this terrible nuisance?' And then someone — Meriwether Lewis or somebody else — takes it too seriously. David: Oh my, a conspiracy. Clay: I've always thought that a great historical novel — and I have to say, novel novel novel! Fiction — would be about Meriwether Lewis killing Callendar. Callendar dies [in 1803], he drowns, in what appears to be a suicide or a severe drinking bout. Every time I've looked at that, Charlie, I've had to wonder whether one of Jefferson's "friends" helped Callendar drown. Do you have any sense of this? Slack: That is a speculation that has been out there almost from the time it happened and I don't think it's beyond the realm of possibility. But, in some senses, Callendar was such a self-destructive character that he was headed that way regardless. There were journalists who had been former compatriots of Callendar's who were now in daily opposition to Callendar and they suggested that Callendar had committed suicide. I don't know. It's just impossible to know. My guess is that Callendar got drunk and went down to bathe in the river and drowned. Clay: Well, it certainly was convenient. Abigail Adams, in 1804, famously said to Jefferson, "the serpent you cherished" by encouraging Callendar, you essentially unloosed a monster and he came back to bite you — and congratulations, you got exactly what you deserve. Probably nobody in the history of the United States damaged Jefferson more that James Thomson Callendar. Slack: The free speech advocate, to my mind, sees it in the opposite light that [Abigail Adams] sees it in. She sees it as, 'Isn't it unfortunate that Callendar was able to say these things because you enabled him'. And my opinion is that it's a good thing we have our James Thomson Callendars. Report of the Committee of Privileges, Motion of the Expulsion of Roger Griswold and Matthew Lyon, Members of this House, for riotous and disorderly behavior, committed in the House. Ordered to lie on the table the 20th February, 1798. James H. Imlay being requested by the committee of privileges to communicate his recollection of the affair between Mr. Lyon and Mr. Griswold, says, that he came into the hall on Thursday morning the 15th instant, a few minutes after eleven o’clock; found Mr. Griswold in the hall, sitting in the chair usually occupied by Mr. Hindman, apparently engaged in reading a letter. Mr. Lyon came into the hall about three minutes after this deponent, with a cane in his hand, and took the seat he usually occupies, or the one next to it on the north side. After casting his eyes around the hall for a few seconds, he appears to be employed in looking over some papers lying on his desk. During this time, which might have been the space of between three or four minutes, Mr. Griswold continued reading his letter. At length he appeared to have finished the reading and was about folding it up, when he discovered Mr. Lyon. At this time this deponent was standing within a yard, or thereabouts, of Mr. Griswold, who immediately on observing Mr. Lyon, walked to the races under the window on the north side of the speaker’s chair, where he had placed his cane; taking this in his hand, he walked to the opposite side of the hall, directly in front of the speaker’s seat, to the place where the member from Vermont was sitting, and when in front of Mr. Lyon struck him with the cane. Mr. Lyon appeared to discover Mr. Griswold about the instant his arm was raised to strike, and at the utterance of some expression by Mr. Griswold, which this deponent did not exactly hear, but supposed to be “You rascal.” Mr. Lyon, when he received the blow appeared to be in the act of rising. Mr. Griswold repeated his blow. Mr. Lyon rose, came out from his seat without his cane, advanced towards Mr. Griswold, as if with an endeavor to close in with him, which Mr. Griswold avoided by striking him or pushing him off with his left hand, and repeated his blows with his cane, as often as ten or eleven times, sometimes striking on his head, and sometimes over the shoulders. Mr. Lyon appeared now to desist from attempting to close in with Mr. Griswold, and endeavored to gain the north-west side or corner of the speaker’s seat. This he did, Mr. Griswold repeating his blows. Mr Lyon being now near the stove, on the same side of the chair as just mentioned, seized the tongs standing by the stove. Mr. Griswold then immediately closed with him, and after a short scuffle, or contest, Mr. Lyon was thrown by Mr. Griswold, who fell with him, and with one hand endeavored to prevent Mr. Lyon from using the tongs to his injury, and with the other struck him once of twice in the face. They were then separated by the interference of several members. What happened without the bar at the west end of the hall, this deponent did not see. James Gillespie being sworn , faith, that on Thursday morning the 15th instant, he came into the house of representatives after prayers, and the speaker had taken the chair; that whilst he was warming himself at the fire next on the right of the door, he saw Mathew Lyon, the member from Vermont, come to the letter bag and was putting in some letters, as he this deponent, passed him going into the house; that the saw also Roger Griswold sitting in a chair s small distance from the speakers seat, with a large walking stick standing near him; and I went immediately to the alphabet and made search for my letters and as I turned to my seat to read them, a heard a noise of blows, &c. on looking that way I saw Roger Griswold strike Matthew Lyon, who was in his place near the center of the front desk opposite to the speakers seat, where he was then sitting; that as Mr. Lyon was getting round the desk he received two or three blows, and on attempting to close in with Mr. Griswold, Mr. Lyon received several severe strokes with the stick from Mr. Griswold. That the deponent conceiving, from the complexion of the affair, that it was a preconcerted plan, did not interfere ], but asked the Speaker to call to order, which he declined, although the call was loud from different parts of the house. That as Mr. Lyon advance on Mr. Griswold, he retreated back towards the window near the speakers seat, by which Mr. Lyon became possessed of a pair of tongs and struck at Mr. Griswold, on which Mr. Griswold closed on him, and they fell, and in a little time were parted. That Mr. Lyon expressed a disapprobation at being parted, and said as he was rising, I wish I had been let alone awhile. That the deponent recollects that, as he turned to his seat, he saw Mr. Sewell from Massachusetts; and on he, the deponent, expressing his disapprobation of such conduct, Mr. Sewell replied it was right, for we ought to have done them justice, and expelled Mr. Lyon; to which I answered, take to yourself all the justice that appertains to it, and went and read my letters, and heard no more for some time, when looking up, I saw Mr. Sitgreaves going our of the fourth passage, with a walking stick, I believe, for Mr. Griswold; and then, and not before, the house was called to order, when this deponent thinks it was more than half past eleven o’clock. I spent Presidents' Day thinking about the best and worst presidents in American history. I don’t put Mr. Jefferson in the top five of our greatest Presidents, maybe not even in the top ten. However, he was, I feel, the greatest man who ever became President of the United States—he’s America’s Leonardo da Vinci—but he did not particularly want to be President, and he had a decidedly understated two-term tenure between 1801 and 1809. 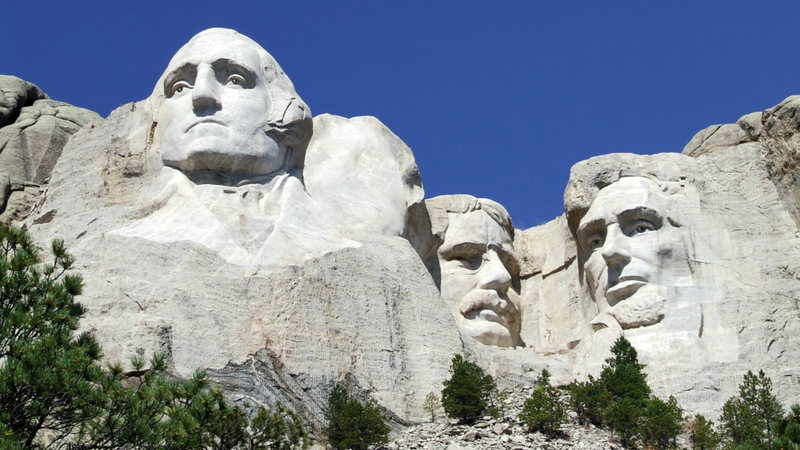 If one person had to come off of Mount Rushmore—Washington, Jefferson, Lincoln, or Theodore Roosevelt—the one to scrape away would be Jefferson. Read Clay's Jefferson Watch essay, "Ranking American Presidents."